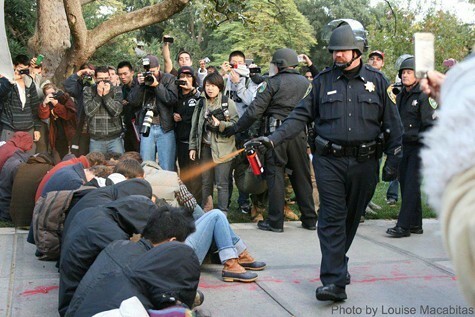 When UC Davis police Lieutenant John Pike casually pepper sprayed Occupy protesters last fall, the shocking incident spurred outrage around the globe. Pike seemed to epitomize institutionalized callousness over income inequality and police brutality. But there’s reason to believe that if Pike or another misguided cop pepper sprayed protesters today it would produce a far more muted response. In fact, a significant portion of the population, turned off by violent Black Bloc tactics at Occupy Oakland protests, might even think that Pike would be justified. John Pike sprays UC Davis protesters. Case in point: A federal jury in San Francisco yesterday exonerated a UC Berkeley cop for smashing the fingers of a student protester with a club in 2009 after she had rested her hand on a fence. Prominent Oakland defense attorney John Burris, who represented the UC student and is perhaps one of the most progressive lawyers in Northern California, told the Chron that the jury’s surprising verdict could be attributed to anger and frustration over violent Occupy Oakland protests. “What’s been taking place with the occupiers, there was an undercurrent in the case that was hurtful,” Burris said. Indeed, the backlash that the Black Bloc and its “diversity of tactics” have caused against Occupy has been growing. Late last month, a KPIX-TV commissioned poll found that 57 percent of Bay Area respondents now say they oppose Occupy, almost opposite of what polls showed last fall. Some 26 percent of respondents in the recent poll said they used to support Occupy but no longer do. The Black Bloc, in short, is not only severely harming Occupy’s reputation in the liberal Bay Area, but the violent actions of the group appear to be prompting residents to side with police who brutalize protesters — even when those protesters are not involved in Occupy demonstrations. The 2009 protest at UC Berkeley in which the student Zhivka Valiavicharska had her finger broken by UC police officer Brendan Tinney was over tuition hikes and predated the Occupy movement by two years. This development — the public endorsement of brutal police tactics against protesters apparently because they’re tired of violent demonstrations — should be troubling for activists around the country, not just in the Bay Area. Indeed, it could set back the cause of progressive political activism for a long time.